(August 29, 2010 –Venice Beach, CA) – Representatives of three Venice residents’ organizations today demanded that the City of Los Angeles and the California Coastal Commission take immediate steps to stop RVs, campers and other vehicles from camping overnight in neighborhoods and dumping their human waste on public streets, which endangers residents and pollutes the coastal waters at Venice Beach. The demand by the Venice Stakeholders Association, Marina Peninsula Neighborhood Association, and Venice Canals Association came in the wake of a widely-publicized incident in which an RV owner uncapped her sewage holding tank and drove north on Pacific Avenue, just a block from the ocean, releasing over 100 gallons of human waste onto the street as she drove. The woman was arrested but subsequently released, and the City of Los Angeles took several days to clean up the mess. Such dumping incidents are common in Venice. Just a few weeks ago, Robert Feist, past president of the Venice Chamber of Commerce, observed a similar act on nearby Electric Avenue. “I saw a man take off the cap of his holding tank and drive down the street spewing sewage right in front of homes,” said Feist. 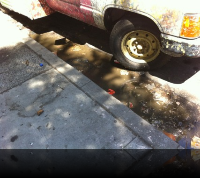 In addition to intentional dumping, the decrepit condition of many of the RVs and campers means that such vehicles often leak their sewage onto public streets. In addition, people who live in vehicles lacking toilets – such as cars, trucks and vans – simply relieve themselves on local streets, alleys and in residents’ yards. 1. City Councilman Bill Rosendahl (CD-11) should immediately release petitions for residents to complete to request the posting of “No Oversize Vehicle” signs on their neighborhood streets, which would ban vehicles over seven feet tall and allow police to remove such vehicles. The Councilman should also expedite the installation of the signs. 2. The Los Angeles Police Department should start aggressively enforcing the City’s current ban on living in vehicles (LAMC 85.02), as well as laws prohibiting criminal activity by the owners of the vehicles, including dumping and leaking of sewage, late night noise, drug sales, prostitution, public inebriation and harassment of residents. To support this effort, the LAPD should increase the number of undercover officers in Venice, and the City Attorney should back up the Department by aggressively prosecuting such violations. 3. The California Coastal Commission, in light of its obligation to protect coastal waters from pollution, should reconsider its recent denial of a permit that would allow the City to implement overnight restricted parking in Venice, a measure that would stop camping in any vehicle, regardless of size. In addition, Venice resident Heidi Roberts called for the LAPD to reverse its plans to redeploy 21 officers away from Venice Beach at the end of the summer season. “The recent dumping incidents and a 240% increase in transient-related crime in Venice, reported by the LAPD’s Pacific Division, makes it imperative that we keep these officers here throughout the year,” Roberts said. Indeed, she noted that the City’s plan to post signs banning oversize vehicles would be ineffective without more officers to enforce the rule.